This sounds like what one preacher said, “Any believer [of Jesus] is a spiritual Jew.” based on Romans 2:28-29. FYI: David Ben-Gurion was the very first prime minister of Israel. It is all by God’s generous provision that I was able to join a group of believers from the USA, Singapore and the Philippines to explore the places mentioned in the Bible last February 29 to March 11, 2016. I cannot but praise Him for this humbling experience to walk where Jesus walked, grew up, and had His ministry. Seeing the probable place where He was crucified, died and was buried reminded me of our Heavenly Father’s sacrificial love and mercy in order to give us our undeserved salvation. It’s a huge bonus to witness ruins of the many places mentioned in the Biblical narratives. 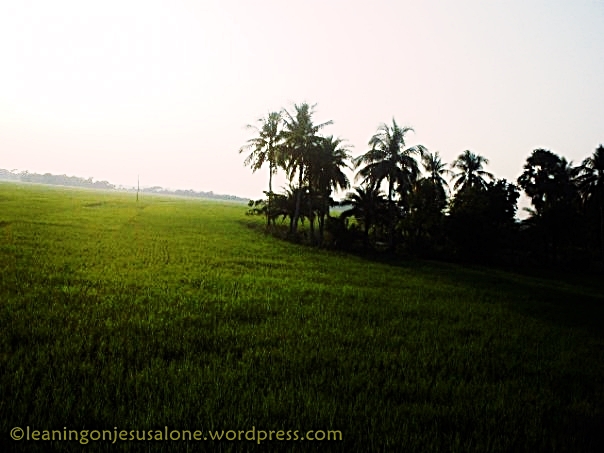 I have this ineffable joy to see places I only read about in God’s Holy Word. Airline: Any international tour is impossible without a plane or a ship cruise. I took Emirates from Bangladesh to Dubai and my flight was apparently on time and smooth. The flight attendants were very much approachable. The crew from the same airline for the next leg of our trip (Dubai to Jordan) was also warm-hearted. Regarding the food I had from Bangladesh to Dubai, I have to say that it was enormous in amount but the taste of prawn biryani is not as good as the one served on Biman Bangladesh. I have to be bias because I live in Bangladesh and I’m proud of the tasty food they serve on their national aircraft. 🙂 Please forgive me for that. I thank God for the safe flight He gave me back to Bangladesh, likewise. I would like to recommend Emirates for their passenger-friendly facilities and staff on the plane. 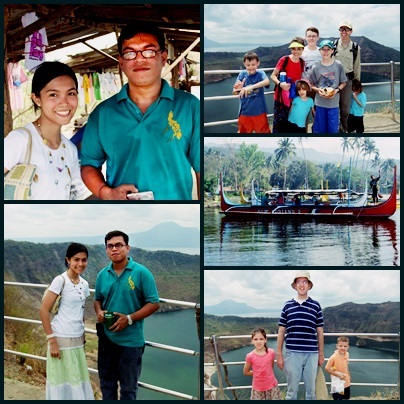 Agency: As far as I can understand, Highlight Tours organized all our itineraries in coordination with our team leader Dr. Berrey, one faithful couple from Gospel Light Baptist Church and another godly brother from Singapore. I would say that the agency is very responsive in dealing with the participants. They sent us necessary documents in time and they even gave us freebies (e.g. name tags, ribbons, a booklet of our itineraries, and a small pouch for our passports and VISAs.) That was totally unexpected! The other two agencies we had were Vision Tours and Sar-El Tours. Vision Tours handed out some maps for us and provided our group with a very professional driver named Basam and a kind and graceful tour guide named Jihan. Shots of Ms. Jihan, our beautiful Jordanian tour guide and Mr. Basam, our driver during our tour in Jordan. It made me so happy that Sar-El Tours gave us some freebies as well (e.g. a cap and a small backpack.) They also made sure that we had a very protective tour guide, Bro. Yoni, who sincerely took care of us as we traveled and he never felt tired to remind us with his resonant voice of how grateful he is that we visited Israel. The said agency also provided “Firaz, the best driver in the middle east.” according to Bro. Yoni. We, as a group, eventually agreed with him! If you know any group who would like to go and see the terrains of Israel and Jordan, I highly recommend the quality service of the aforementioned tour agencies. Hotels: There were a total of seven hotels we stayed in: Dead Sea Spa Hotel, Leonardo Hotel in Haifa, Leonardo Club Hotel in Tiberias, David Hotel (Kibbutz Ein Gedi) beside the Dead Sea in Israel side, Leonardo Hotel in Jerusalem, Radisson Blu in Aqaba and Olive Tree Hotel (Geneva) in Amman. All the hotels provided wonderful service, served good food and had helpful crews. I noticed that all these hotels welcomed us with drinks and cookies or dried fruits. Regarding rooms, I would say that my favorite was that of Olive Tree Hotel since they provided a spacious room. Team Leader: Our main team leader is Dr. Timothy Berrey. His wife, a wonderful example of godly womanhood, was the one who announced the coming trip to Israel and Jordan on her blog. I thank both of them for sharing with me a special way to join the tour. Everyone in the group respects Dr. Berrey for his discipline and timeliness all throughout our journey. He also displayed a generous example of servant-leadership. The trip made me realize personally that our leader’s stupendous skill in time management made us get to the places we planned to visit and eventually, have some time to visit extra ones. Needless to say, it is remarkable that Dr. Timothy always tried to point us to Scripture references associated with the places we visited. Places: I will try to publish a separate post on the places we have seen as time permits. Please hang in there. 🙂 If you are interested to know our specific whereabouts, you may check this out. This update was diligently and thoroughly recorded by one brother who is currently studying theology in preparation for the ministry God is calling him to do. 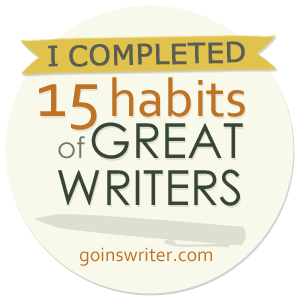 Impression: This review will not be complete without letting my family and friends know the five significant lessons I learned from this trip. I cannot stand without sharing with you what musings I had from this memorable tour. 1. I have to be intentional whenever and wherever I visit. Before this trip, my prayer was that God would reveal His purpose for allowing me to join this indelible journey. Sure enough, God answered my prayers. It was in God’s plan that He allowed me to read a few books of the major and minor prophets before and during the trip. Contemplating upon my reading and the trip, He revealed to me how much I need to sincerely pray for the people of Israel–to pray for the Messianic Jews to be bold as they continue to preach the gospel to those who have rejected Jesus to be the Messiah. May God remind me of this precious lesson (i.e. to be intentional in traveling) the next time I visit any place. 2. My ability to travel is a mere testimony of God’s gracious provision. As I mentioned to the members of the this tour group on our last meeting in Jordan, I praise the Lord for giving me a gracious husband who did not withhold this rare opportunity for me to explore Bible Lands. My in-laws, together with him, encouraged me to grab this chance. Since they cannot obtain a VISA to Israel, I brought home a bunch of photos from this tour. I have to give God the glory for this blessing! 3. Traveling is an opportunity to serve and love others. I am very much delighted to have traveled with a group that loves Him and His word. I appreciate each of the group members who sought opportunities to extend help to all other members of the group in cash or in kind. We will treasure the lesson our tour leaders taught us that we should be responsible one for another. 5. Traveling is an opportunity to praise and adore Him for His creation. It was in the High Place of Sacrifice in Petra where the Holy Spirit convicted me of how small my faith is. There have been things in my life which I fear to entrust to God but after seeing all the humongous rocks in Petra which are dependent on our Omnipotent God, I am challenged to put my trust in Him continuously wherever life may take me. It is noteworthy that a few from the group who reached the peak of the High Place of Sacrifice with me took the time to read from Psalm 19 and sang a few hymns about God’s greatness. 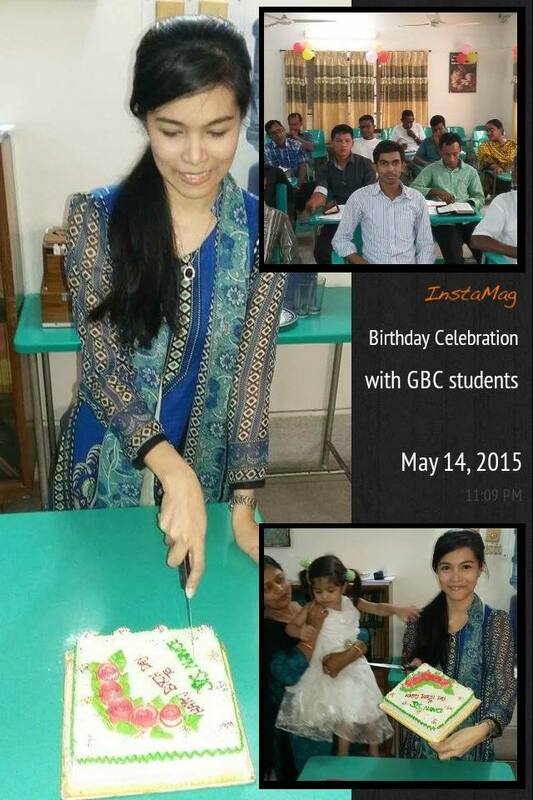 It was a divine fellowship–a memorable one! Indeed, seeing the beauty of Israel and Jordan is something I will cherish in my heart and mind. Reading God’s Word will never be the same since I now have a mental picture of the places mentioned in the book I dearly love. My dear friend, if you will be offered to go and visit Israel and Jordan, please do so! I assure you that you will feel more connected to God and His Holy Word. What are the lessons you have learned from your recent travel? Please feel free to share them with me and other visitors of this blog. I am sure that your travel experience was likewise spiritually, mentally and physically refreshing as ours. To God be all the glory! I’m enthralled. Joanna, my daughter, just started going to school. Just imagine how teary-eyed I was when I first dropped her off at school. Can anyone relate to this? Recently, she experienced her first-ever visit to the zoo with her teachers and class friends. This is her fourth time to visit a zoo but this one is special because she went with her new friends. Everyone started walking to the animal’s cages. People enjoy watching the monkeys play inside their cage. Can you find some more monkeys? There were a few flower gardens! Crocodiles are called “Kumir” in Bengali. Peafowls. I’m very sorry to have missed seeing these peacocks opening their feathers. Our camera’s battery died even before Joanna’s excursion finished. I should have brought a charger but I would not have found any place to charge our camera. Joanna enjoyed running around the zoo with her school friends. She was also happy to see this colorful bevy (i.e. a family of peafowls). This one is chained and amazingly, elephants in this zoo don’t smell since they are given a bath from time to time in a day. Oryx–one type of a deer. I haven’t seen this in the Philippines before. Thank God for this privilege! Another type of deer. Can you realize how creative our Creator is. He makes every animal unique! These donkeys reminded me of Jesus’ triumphal entry. Giraffes. Trivia: Giraffes spend their life standing up. In fact, they doze and give birth standing up. I am just amazed at how clean Bangladeshi zoo is! The animals we saw were well-fed. More hippos at a different angle. I’m grateful to God for giving my daughter this privilege to see His wonderful creation. As I have mentioned, my camera ran out out of battery so I missed taking photos of other animals such as lions, tigers, different types of birds and so on. I’m also glad that God enabled me to meet other mothers from Joanna’s school too! It is my prayer that God will use me to share with them the gospel in God’s time. For now, I can only pray for their salvation. Anyway, just a few comments about Bangladesh National Zoo. There’s a variety of animals available for viewing. The place is very clean. If you are going to have a picnic there, there are water tanks available for washing your hands, plates and glasses. There are wide and breezy spaces where you can lay your picnic mats down. Food is available for purchase inside the zoo. Visitors are allowed to bring their own food. Vendors keep handing balloons and other toys for sale to the kids. Kids end up persuading their parents to buy what are not so necessary. Foreigners might find it hard to understand what are written on the name boards of animals if they are not familiar with Bangla. OVERALL: The place is a wonderful place for picnic and enjoyment. It’s also an excellent place to see God’s handwork. Isn’t it amazing how animals declare the glory of God? My daughter is now three years old and she loves spending time with me. One of the activities she enjoys doing with me, of course, aside from playing, is baking. 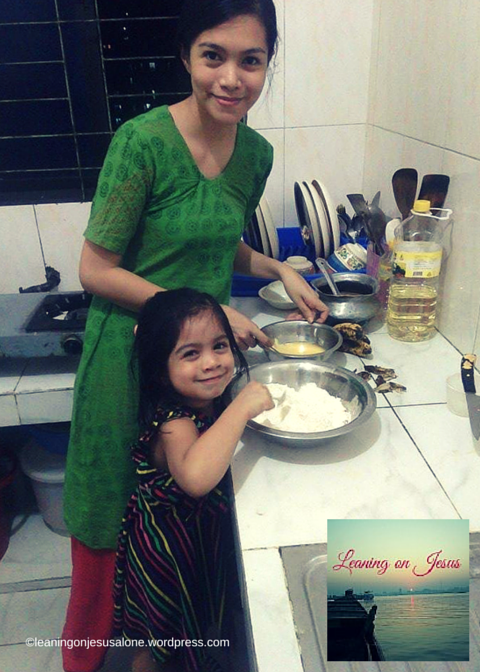 I would like to share with you a photo of my little moppet and I while baking. Joanna is in charge of mixing up the dry ingredients and I mix up the wet ones. She’s one little happy baker. Writing out this first-ever recipe that she has tried is worth-doing. Maybe some moms would agree with me so here is the recipe that we have customized. 1. Mix up all the dry ingredients. 2. 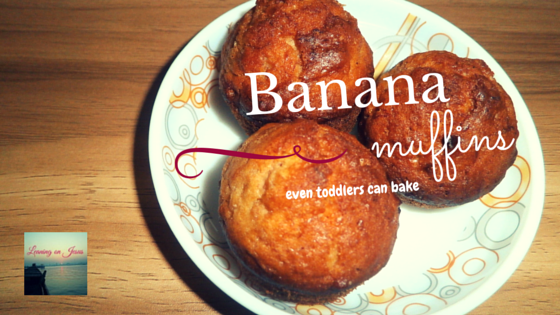 Mix up all wet ingredients (whisked egg, mashed bananas and oil). 3. 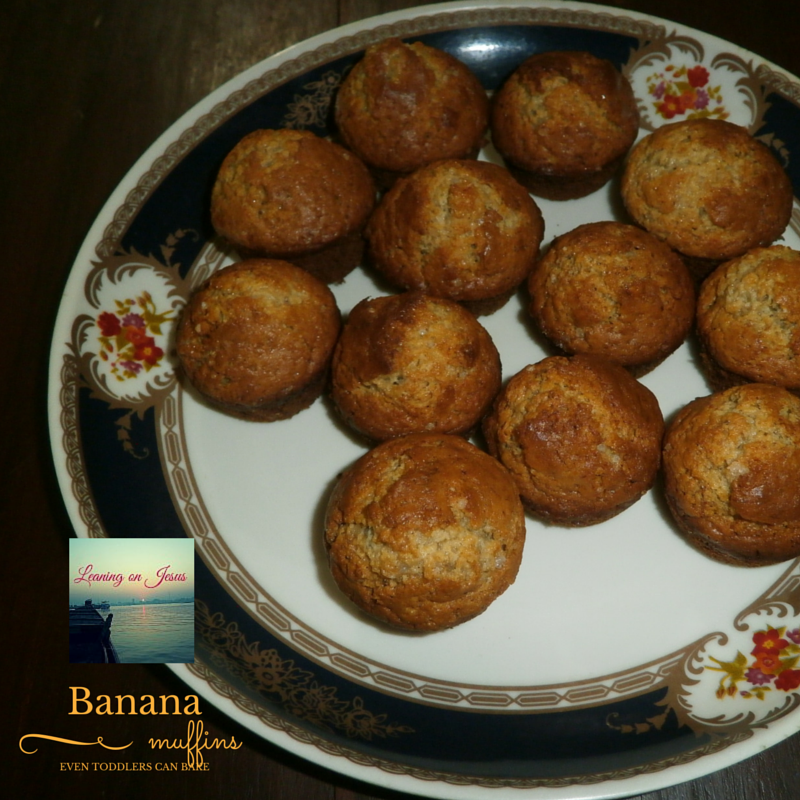 Scoop them up into the muffin tray. 4. Pre-heat the oven and set it up to 190°C (375 °F). Bake for 12 minutes. Now, you can either print this recipe out or get a pen and recipe card and jot down this simple recipe. Please try it with your toddler. 🙂 I promise that this will be such a fulfilling experience not only for you, but most especially for your toddler who enjoys adventure at this stage. I know. 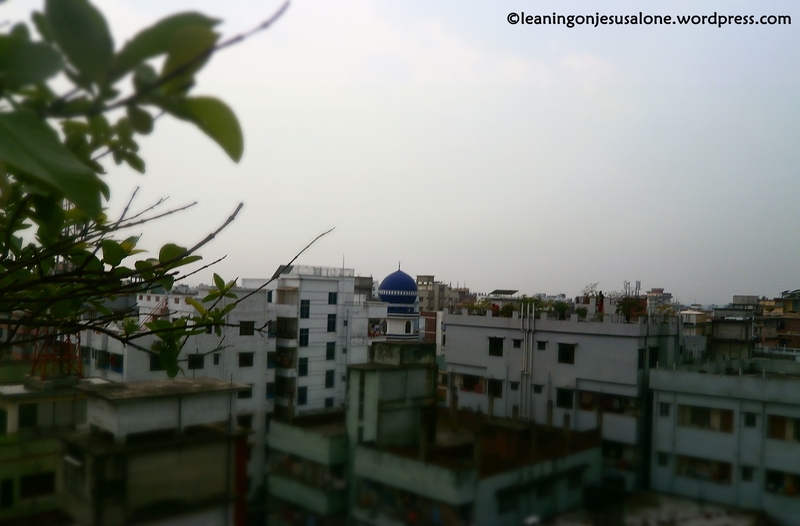 It’s a little fascinating at times that most of the new people I meet always get shocked, or I should say, excited when I tell them that I am living in Bangladesh! I really would love to give them a detailed answer but normally, we just have a limited time so I can’t really elaborate my answer. Considering the aforementioned situation, I had a meeting with me, myself and I in the conference room of my brain and I concluded that it would be interesting to write out my answers so I can also give a much better thoughtful response using a good chunk of time. 1. Why do you live in Bangladesh? This is the top question I am asked in any first time conversation. Well, I came here first of all because my husband is a local of this country and I am here to support him in his desire to do his share in penetrating this nation with the seed of the gospel. That was the theme of our sacred union anyway–to join as lights together for Christ. 2. What’s the general flavor of Bangladeshi food? Bangladeshi food is generally hot and spicy. The main spices present in every dish here are onions, garlic, plain cumin powder, plain turmeric powder, plain chili powder. bay leaves and garam masala, a fragrant blend of ground spices used in Indian cuisine, often containing black pepper, cardamom, cinnamon, cloves, coriander, nutmeg, and turmeric. 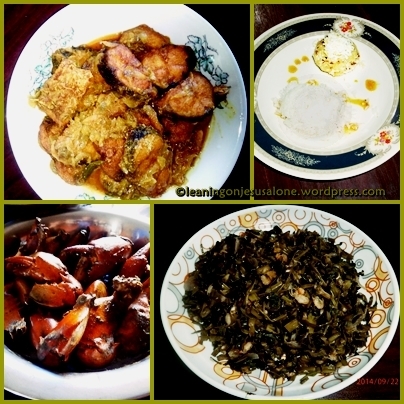 I have learned to cook local Bangladeshi dishes and they are pretty simple and easy. Watch out for some recipes I would share with you in the future. Now, I have to debunk the myth that Bangladeshis, just like Indians, eat just chicken curry everyday. I would say that it might be true for other families but not for ours and the other Bangladeshi families I know. 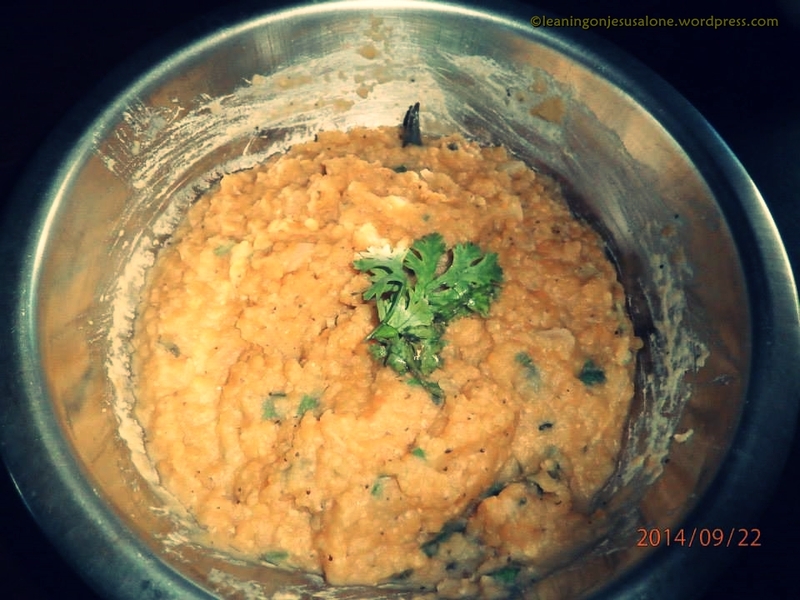 We have what we call “Daal” or Lentil soup, “Shak” or sautéed greens, “Alu Vorta” or mashed potatoes, “Daal Vorta” or mashed lentils and many more for lunch and dinner. 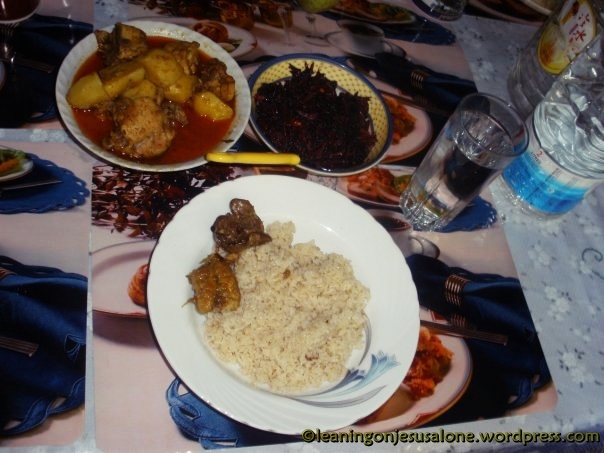 Here’s a typical Bangladeshi set of meal: chicken curry and shak (any vegetable tops). Chicken curry can be replaced with fish, shrimp, crab or assorted veggie curry. 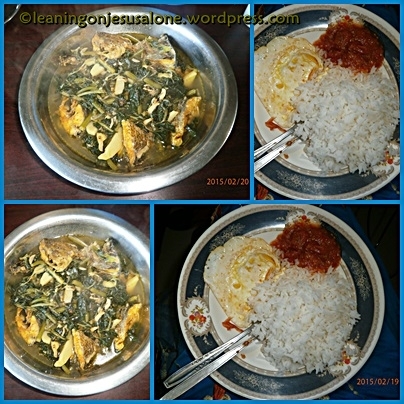 Fried eggs, boiled tomatoes and boiled fish with greens. See? These dishes don’t have so much spices. 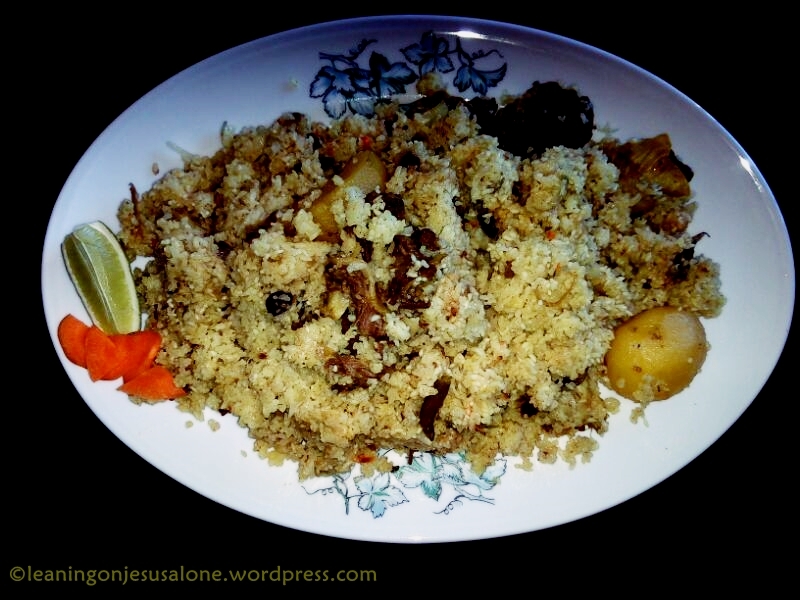 In our family, we usually prepare Biryani (see photo below) and fried aubergine when we have guests at lunch or dinner. If we serve Pulao rice, we pair it with chicken or beef curry. Yummy Biryani-a mixture of steamed aromatic rice, meat, spices , potatoes and other optional vegetables. I hope I didn’t make you drool by showing these mouthwatering dishes. Please come and visit us sometimes and I’ll be more than willing to cook these dishes for you. Bangladeshis are beautiful people in and out if you get to know them deeply. 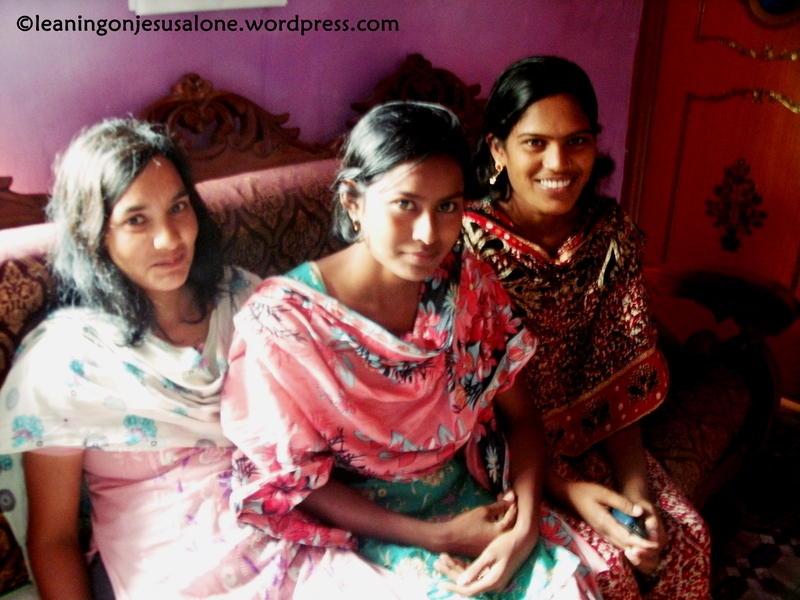 These are friendly college girls I met years ago in the village and I praise God for the privilege to share the gospel with them. They were quite receptive to the gospel. They did not outwardly profess faith in Jesus Christ right there and then, but I was thrilled to hear them ask questions about God. Generally, their generosity is displayed when someone visits their house. They wouldn’t come to your house empty-handed. If you invite them for lunch or dinner, they will give your household some sweets in return. 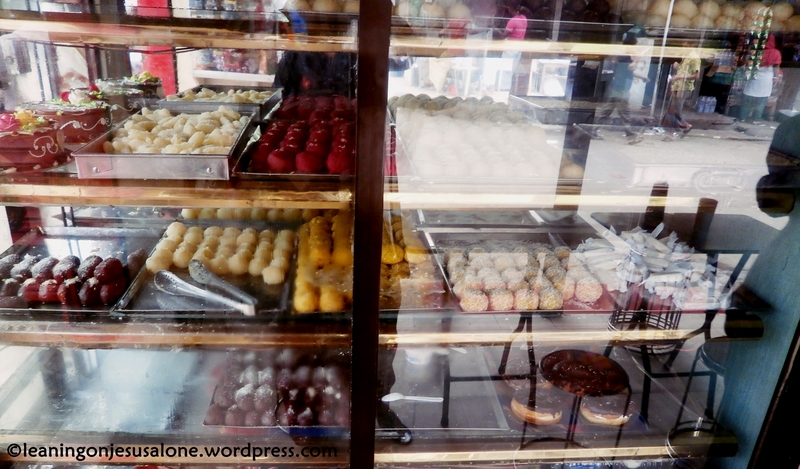 Bangladeshi sweets come in different shapes and colors. 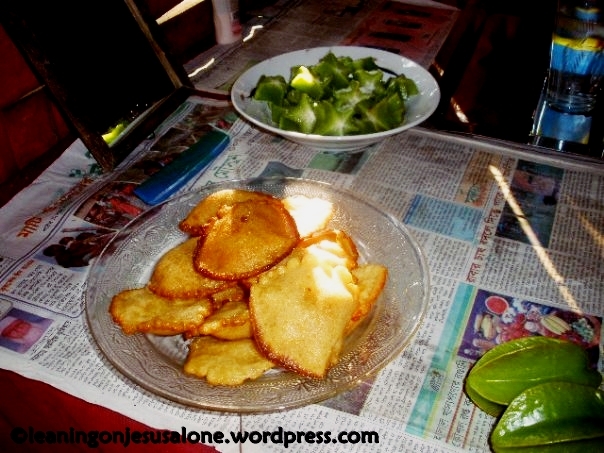 They also have varied flavors but the main ingredients of these sweets are milk and sugar. They are also very hospitable. Take a look at the caption of the photo. While coffee is popular in the US or in the Philippines, tea is the common drink served to their guests. Bangladeshis are so hospitable that they serve whatever they can despite their poverty. 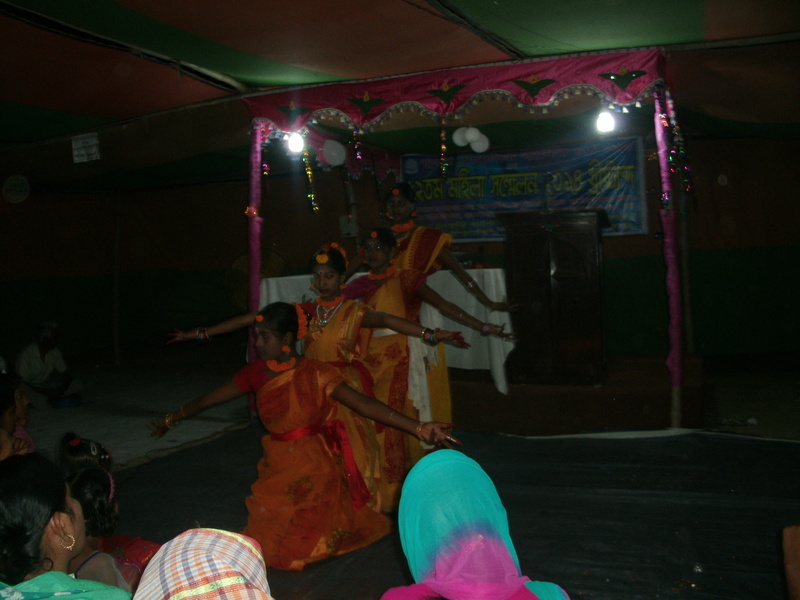 Part of any program intermission is either a folk song or any traditional dance number. 4. What’s the primary religion of people over there? Approximately ninety percent of the people here are Muslims, most of them though are just nominal ones. In the village where I stayed, people are mostly Hindus. It is said that around 8-9% of her population is Hindu. Only a little percentage of people are Christians, Buddhists and of other religion. I learned later that you can tell a person’s religion in this country by his or her name. No wonder my husband’s name has a Christian influence. It’s our earnest prayer that we could reach a few of these unsaved souls with the gospel. Alright, I guess these would be all for now since I know that you might need to run an errand after reading this but please consider praying for us as we continue to stay here and shine as lights together for Christ. Watch out for the next part of this post. Empanada Crust–Choose Your Own Filling! Have you ever had that craving that you can’t resist? Well, I’ve had that many times. It’s been our custom as a family to have our “Friday Food Feast” since Friday is like Sunday to us in Bangladesh. That’s the time, we enjoy sumptuous food with our family and friends. “Where can I get a recipe?”–That was one of my questions and then I suddenly remembered something! As I mentioned in my previous post, my father loves cooking and he used to buy cook books from National Bookstore. Fortunately, my mom carefully kept one of them so I decided to bring it here in Dhaka so I pulled it out and looked for the recipe. 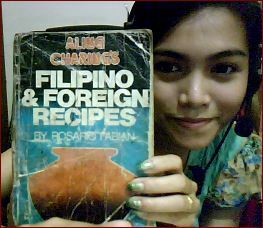 ALING CHARING’S FILIPINO & FOREIGN RECIPES by Rosario Fabian One of the priceless legacies of my father! I found the recipe and tried it out. As almost everyone does, they try a recipe and post it on Facebook. 🙂 I did that too and one of my cousins asked me about the recipe for the crust only! So…let me share with you the recipe for the crust only from this book. 🙂 You can decide as to which filling you would like to put. You may put cooked tuna or any left over you have in your fridge. In my case, I used chicken curry. Mix sugar, salt, and flour. Cut in butter using a blender or 2 knives until it resembles coarse cornmeal. Sprinkle water and mix well with hand to form a ball. Knead lightly. Sprinkle flour on a board and roll out dough into 1/4″ thick. Cut using a round cutter (a medium sized saucer can be used if there is no molder. Place saucer up-sde down on dough and cut with a knife.) Then, fill each cut dough with 2 tbsp. of sauteed fillings. Fold dough to form a half moon, press one end to the other. Brush with egg yolk or milk. Arrange on a grease baking sheet. Bake at preheated oven until crust is golden brown. There you go! The book did not specify the amount of time and temperature needed for this recipe but I set our oven to 190°C and baked the empanada for around 15 minutes. I followed my nose and turned it off when I smelled that it was done. 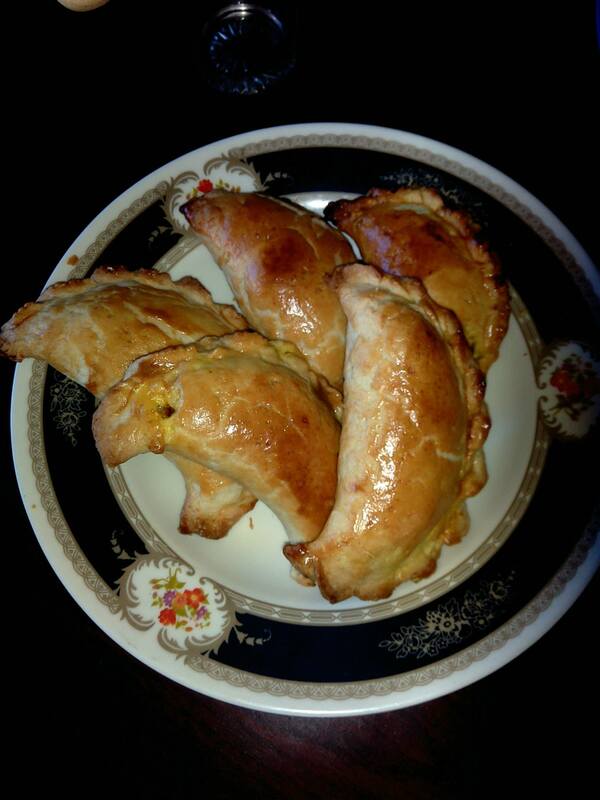 Make your family happy with this empanada, and as I said, just choose your own filling! Of course, remember to thank God for this blessing before posting it on Facebook! Let me know if you succeeded in trying this one out. Just like any other couple, it is but common for us to talk about excitement to grow old together. Of course, prior to that long commitment is marriage proposal. All the while, I knew that my husband would give me our engagement ring but the question was how and when. 🙂 My mother and Joseph’s parents, our ever-loyal love team fans, had given him their blessings and so did my pastor. Upper Left, Right & Lower Right: A usual visit of Joseph to our house means my mom would cook special dishes which she would not cook for me. That’s how special he is to my mom–I’m jealous. 🙂 Lower Right: A shot from our Bridal Shower. 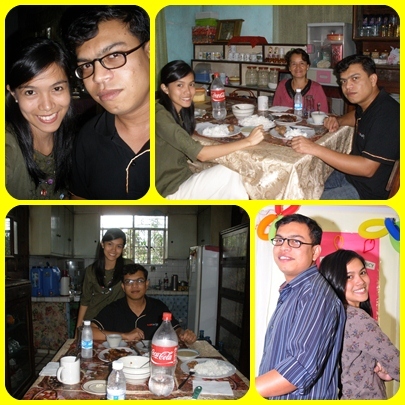 Last New Year of January 2010, it was expected of my first and last boyfriend who is now my husband (Joseph) to come over and celebrate New Year with us. His family is in Bangladesh so we got used to having him over during special occasions. He then came over to see my mom and me. A few minutes after our chitchat, he called my mom and discreetly talked with her. Clueless, I just stayed quiet in one corner. Joseph then invited me to go to Dencio’s restaurant. 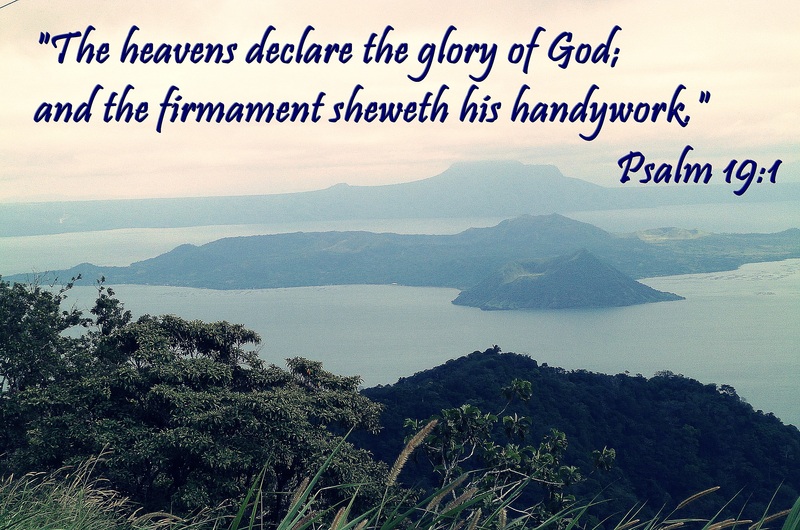 The stunning view of the Taal Volcano and the cool breeze of Tagaytay made our day very special. After that short “out-of-the-blue” interruption, we kept on eating. The food was so enjoyable and to end our meal, I sipped my favorite Buko Juice up until it was finished. 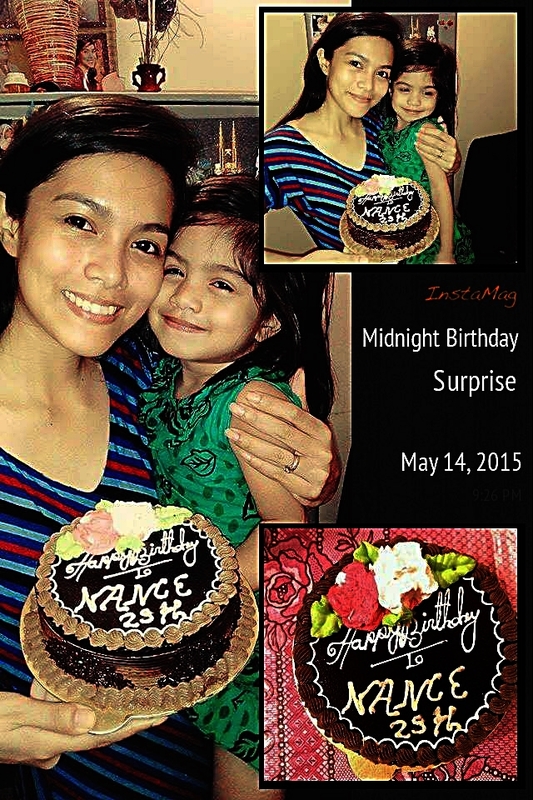 To my surprise, there was something in the Buko shell! Eventually, I learned that my husband mischievously dropped the lovely gold engagement ring into the Buko shell. After finishing my coconut juice, he initiated to take the ring out of the shell and put it into my ring finger. I think he was so nervous that he forgot to ask “Will you marry me?” He said from his heart “I love you so much Sona.” Later, he told me that the ring was made from his childhood necklace. His parents had it made into my engagement ring. A personally customized engagement ring from my husband’s childhood chain. 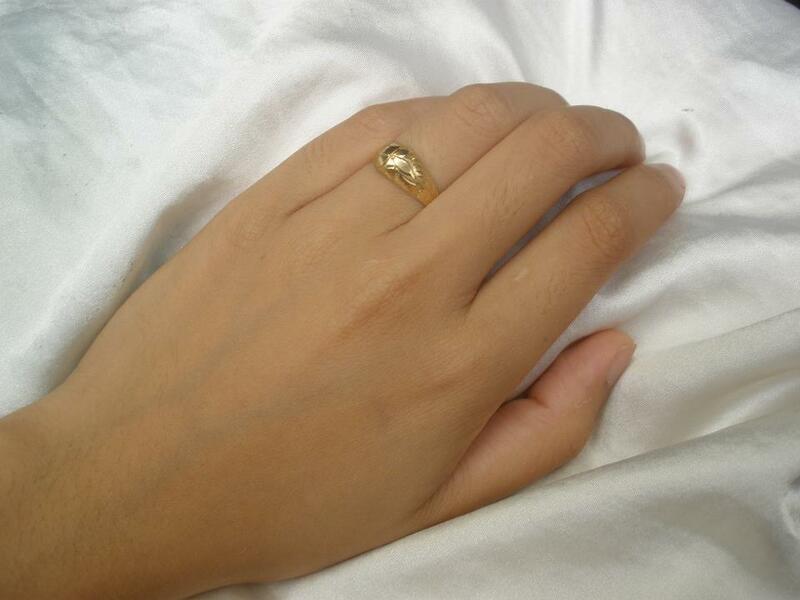 I was so touched with what he and his parents did just to be able to give me an engagement ring. On March 6, 2010, we had our pre-nuptial arrangement in my church with my pastor, my mother, two of our Bible College professors and their family. Prior to that pre-nup arrangement, my fiance and I, along with our American college professors, climbed up the mountain beside Taal Volcano. The funny thing is, a week later, people were prohibited to hike that mountain for a while since it was showing signs of possible eruption.